Make plans now to attend the fourth annual Port Aransas plyWooden Boat Festival in beautiful Port Aransas, Texas on April 6th - 8th, 2018. This is the event that should have been held in October 2017 but had to be postponed due to damage caused by Hurricane Harvey. The Traditional Small Craft Association in conjunction with the Port Aransas Preservation and Historical Association representing Farley Boat Works are combining their efforts to hold this event - concurrent with the annual Port Aransas Old Town Festival - to celebrate 80 years of plywood boat building. If you have even thought about building a boat, you owe it to yourself to attend. You will be able row and paddle boat, hear lectures and presentations about wooden boat building, see a 40 foot Scow Schooner under construction at Farley Boat Works, or even build a boat yourself at a Family Boat Building event that runs from April 6th-8th. There will even be children's toy boat building. 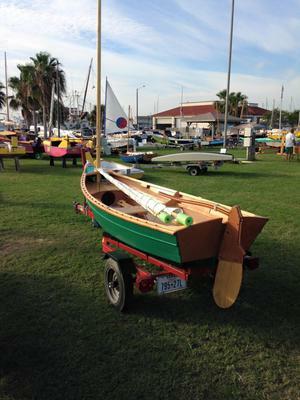 On Saturday, April 7th we will have a boat show where dozens of home built wooden boats will be on display. Bring a wooden boat to show. Congratulations to the organisers for rescheduling this event. And our deepest commiserations to Port Aransas and everyone else who suffered as a result of Hurricane Harvey.